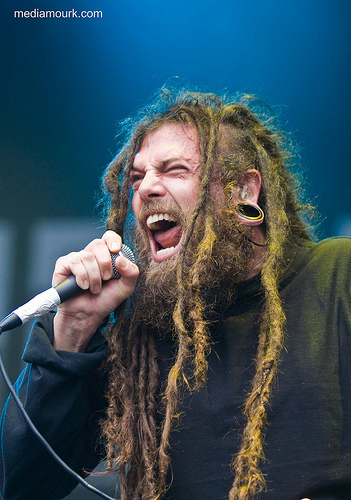 Yesterday Metal Blade TV airs an exclusive interview with SIX FEET UNDER front man/death metal veteran Chris Barnes as conducted by Metal Blade CEO Brian Slagel. The clip comes in anticipation of the band’s forthcoming new full-length, Undead. With an updated lineup featuring Barnes alongside guitarist Rob Arnold (ex- Chimaira), longtime guitarist Steve Swanson (ex-Massacre), bassist Jeff Hughell (ex-Brain Drill, ex-Vile), and drummer Kevin Talley (Dying Fetus, Misery Index, Chimaira), Undead finds the band revitalized and spewing forth some of their most uncompromising, provocative and plainly scathing tunes of their career. Undead was produced by Mark Lewis (Deicide, Devildriver), mixed by Jason Suecof (Whitechapel, Job For A Cowboy), at Audio Hammer Studios in Sanford, Florida and is scheduled for North American release on May 22, 2012 through Metal Blade Records. To check out the interview, as well as first single, “Formaldehyde,” go to THIS LOCATION. In conjunction with the release of Undead, SIX FEET UNDER will demolish the masses on a near three-week run of live rituals this June. Dubbed the 18 Nights Of Blood Tour, the journey will begin in Atlanta, Georgia on June 8. Support will be provided by Dying Fetus and Revocation. Comments Barnes: “We want to get out there and pretty much destroy. We want to play to as many people as possible, and show all of the fans out there the new songs, and leave nothing but a trail of blood in our wake. We’re hoping that whoever makes body bags are upping their output, because after this record comes out there’ll be a lot of decomposing bodies out there! Last week Guitar World hosted the exclusive premiere of “18 Days,” the second official single from the death metal monarchs. If you missed it, you still have a chance to crush your ear drums at THIS LOCATION.